The Monacan community today centers around Bear Mountain in Amherst County. At this site, a log cabin was built in the late 1870s and used as a church for the Indian people. Later, it functioned as a school. Today, the log cabin is a recognized National Historic Landmark. The Episcopal Church has operated an Indian Mission here, since 1908 and in 1995 it returned 7.5 acres of land to the Monacan Nation. In the late 1960s, the school it conducted was discontinued after Monacans petitioned to attend public schools. Our tribal museum is located at this site, developed by the Monacan people with grants from the Virginia Foundation for the Humanities, the Sweetgrass Foundation, and the Easley Foundation. The log cabin is presently being restored, and the museum is equipped with proper technology for storing and displaying artifacts. 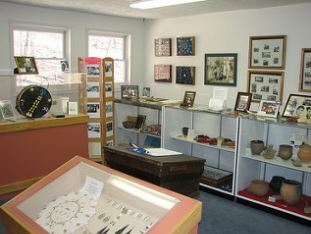 Many artifacts are now displayed at the museum, with plans to acquire more displays over time. 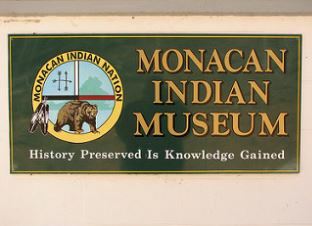 The Monacan Ancestral Museum is staffed and operated by volunteers within the tribe. committed to preserving the rich legacy of the tribe's history and culture. Monacan Museum Hours: The museum is avaliable for visits by appointment only at this time. Please call the museum or the Tribal Hall to arrange your visit to the museum. Due to the drastic changes of the weather in this area, the museum will not be open during storms or snow. There is a $3.00 per person fee to tour the museum. Monacan Indian Museum Heritage Foundation Membership Fundraising for the Museum is an ongoing effort to ensure the preservation of our culture and the ability to share our beliefs and ideas with others. Without your support, as a member, the Museum will not be able to grow and increase its programming to benefit the tribe and surrounding community.